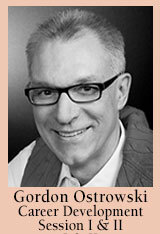 Gordon Ostrowski, Assistant Dean/Opera Producer, has served as a administrator, artistic producer, stage director, and teacher at Manhattan School of Music since 1991. He serves on the board of directors of the National Opera Association as Vice President for Conventions. He also serves on the board of directors of the Douglas Moore Fund for Amerian Opera, placing promising young composers in opera residencies with professional opera companies. He has served on the board of directors of Opera America and is past president of Opera for Youth, Inc. He has directed Die Zauberflote for the Tuscia Opera Festival in Viterbo, Italy in 2011 and Don Giovanni and Le Nozze di Figaro for the New Opera Festival of Rome. He has taught acting style at the Chautauqua Opera since 1998. He made his debut directing Madam Butterfly for Opera Pacific in 1991. He was previously served at the University of Southern California as producer/stage manager; the Santa Fe Opera as production assistant and assistant director; the Cincinnati Opera as assistant director and stage director of ECCO (Ensemble Company of Cincinnati Opera); and Michigan Opera Theatre as assistant to the director. He is a graduate of the University of Missouri and Central Michigan University.